A cork serving tray is a wonderful conversation starter and perfect to use on occasions when you are serving wine and cheese to guests. 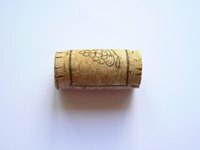 Often people have wine cork collections that represent the memories they have of good times with friends and families. The wine corks may come from bottles all over the world with many interesting designs on them. It's easy to make a cork tray perfect for your next party. Select an unfinished wood serving tray from a craft store like Michael's. These serving trays have hand grips and a secure wood bottom. Sort the corks by size and interest. Pre-fit corks into the tray trying different patterns until you find a pattern you like. Cut the bottom corks in half lengthwise so that the winery symbols and lettering is preserved. Use an X-Acto knife and a metal ruler for easy clean cuts. Apply a bead of construction adhesive to the flat, bottom side of each cork and glue the cork to the bottom of the tray. Follow the chosen pattern until the entire floor of the tray is cork. Pour resin over the corks until the tops of the corks are under the resin. This is an optional step if you want to have a flat bottom and in order to more easily clean the bottom of the tray after spills. The wood tray can be stained and finished with any wood stain and finish product. Test staining the cork as well for different effects.